On Wednesday, 20 February 2019, Whanganui District Council and Arthritis New Zealand launched the national pilot of the Cycle Forward programme, which aims to get people with arthritis into cycling. Philip Kearney, Arthritis New Zealand Chief Executive, says, “We were absolutely thrilled to be in Whanganui to launch this programme, which is the first of its kind in New Zealand. Guests at the launch heard information about how cycling can have tremendous benefits for those with arthritis”. 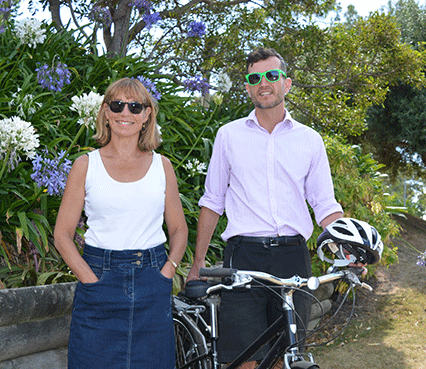 Arthritis New Zealand educator Lori Davis and Whanganui District Council active transport facilitator Norman Gruebsch. The Cycle Forward programme will begin with 10 participants for the first intake, which begins on Wednesday, 13 March 2019. In July 2019, the programme will be evaluated and is expected to be broadened out to a further 20 participants in the second half of 2019. “We’re keen to have people from different backgrounds and hope to attract a range of age groups as arthritis affects people of all ages,” says Lori Davis. Let’s Go Cycle Skills Co-ordinator Greg Fromont says the Cycle Forward programme “is participant-led, with coaches providing guidance and working responsively with people according to their skill and confidence levels, rather than giving one size fits all instruction”. Cycle Forward launch discussion in Whanganui on 20 February 2019. Those who are selected for the programme will be loaned a bike and helmet if required, and will attend eight sessions over a six-week period. Mr Fromont says the sessions “are designed to provide a progression, moving participants from riding stationery spin cycles, to field riding, to shared pathway riding, to road sessions”. Whanganui District Council’s Active Transport Facilitator Norman Gruebsch says, “the purpose of the programme is to give people with arthritis the confidence to take up cycling and build it into their everyday travel around town. After the programme is completed, a social riding group for those with arthritis will be established, to make it easy for participants to keep up the good work”. Read more about how exercise can help your arthritis symptoms. Arthritis New Zealand relies on community funding to deliver our services to those living with arthritis. Please consider making a donation. Hi, I’m very interested in the cycle forward programme and wondering if there might be one starting in the near future in South Auckland. I was diagnosed with arthritis 40 years ago at the age of 19 and at that stage stopped riding a bike. I’ve recently tried with my husbands help to learn to ride again, but I’m not very confident and find our property is not ideal to learn. Would love to be able to access a group like this.